Congratulations on the birth of your son, Zachary! How do you feel about arranged marriages? Maybe you will at least consider an arranged play date? This Tiny Dancer is the perfect match for your Levon. haha. doesn't this SCREAM Elton John? I just adore the ideas you come up with. 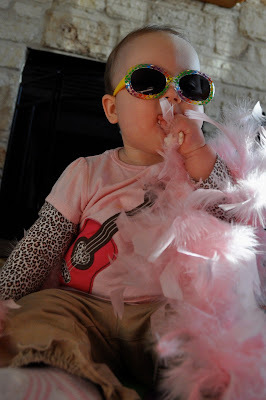 Chloe looks really good and ready to perform with Elton John with the pink feathers and wild eye glasses on. Hope I can afford a ticket before they sell out. BE SURE TO GET A FRONT ROW SEAT FOR ME. Chloe's a rock star! Yeah! LOOOOOOVE these photos! Rockstar Chloe is too cute! Her outfit is tre'chic! LOVE IT!! Mar-ve-lous dawling just mar-ve-lous. She sure does rock!! Oh my, Elton John would LOVE her!